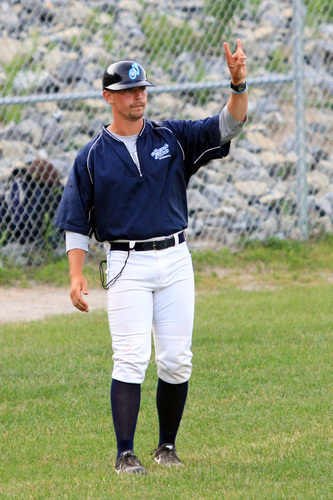 Mike Armstrong of the Newark Pilots has been named to 2014 PGCBL Coach of the Year. Photo Courtesy of Steve Plopper. The Perfect Game Collegiate Baseball League is pleased to announce that Mike Armstrong of the Newark Pilots has been selected as the 2014 PGCBL Coach of the Year. In 46 games, Newark hit .271 as a team, the third highest batting average in the PGCBL. On the mound, the Pilots had the third lowest ERA in the league at 3.93. On defense, Newark had a .964 fielding percentage, the second highest in the league. Newark starter Jayson Yano, who was named the 2014 PGCBL Pitcher of the Year, led the PGCBL with six wins and posted the second lowest ERA at 1.35. Pilot shortstop Tanner Giesel led the PGCBL with 35 RBIs and finished tied for second with 78 total bases. Both Yano and Giesel were named to the first team All-PGCBL on Monday. Fellow Pilots Samm Wiggins, Jack Gerstenmaier, Tommy Wagner and Travis Laitar were named to the second team All-PGCBL. 2014 was Armstrong’s second season guiding the Newark Pilots. In 2013, he led Newark to a 22-25 record, good for second place in the West Division. Armstrong joined the Pilots as an assistant coach in 2012. He worked under head coach Chris Ebright who had guided the Pilots to the Perfect Game Collegiate Baseball League championship in 2011. Armstrong is an assistant baseball coach at Amherst (Mass.) College.